Hi! I created this page in January 2011 to answer some of the farmgirl questions I'm asked most often. If you're specifically looking for something (or somebody) on this site, try the handy dandy custom Google search box in the upper right sidebar. It will search just Farmgirl Fare and In My Kitchen Garden. What kind of camera do you use and how do you edit your photos? My approach to photography is very easygoing. I'm much more concerned with capturing moments than with technical expertise. (I'm also lazy and impatient when it comes to learning technical stuff.) I carry my camera everywhere and sometimes turn it on and off dozens of times a day. We use lots of rechargeable batteries. Since November 2007, all the photos on Farmgirl Fare and In My Kitchen Garden were taken (along with over 35,000 others) with a Canon PowerShot A630 point and shoot camera. Nearly all were taken on the auto setting. I love the zoom and macro capabilities, and I almost never use the flash. The A630 is my second Canon PowerShot, and I have nothing but good things to say about the PowerShot series. I recently upgraded to a Canon PowerShot G11 and I really love it but haven't started using it yet. I rarely crop images (too many choices! ), preferring instead to frame my photos in the viewscreen. I use Microsoft Digital Image Suite 2006 Editor to quickly auto fix the exposure and contrast (on most images), add the watermark, and resize them down for the web. In February 2011, I bought Adobe Photoshop Elements 9 (which came bundled with Adobe Premiere Elements 9) and so far it's pretty neat, though it's taking me a while to figure it out. Do you sell prints or greeting cards of your farm photos? Thanks so much to all of you who have asked me about this over the years. I'm flattered. Offering prints and greeting cards from my photos has been on my Really Want To Do List for a long time, and hopefully one of these days in the not too distant future it will actually happen. When it does, you'll be the first to know! I'm an artist and I love your photos. Can I make and sell paintings of your photos? I'm so glad you like them. The answer is yes, but with some conditions. Please email me for the details: farmgirlfare AT gmail DOT com. How can I print out your recipes? At long last, I'm now able to offer you printer friendly pages for my recipes. Starting with December 2010's Big, Soft & Chewy Molasses Ginger Spice Cookies with Raisins and Old-Fashioned Pumpkin Spice Cake with Orange Cream Cheese Frosting, all new recipe posts will include a 'click here to print this recipe' link. As time permits, I'll be going back and creating printer friendly pages (and adding links to them in the original post) for the 100+ recipes I've shared since starting this blog in 2005. In the meantime, the easiest way to print out an older recipe is to highlight and copy the recipe, paste it onto a text page (such as WordPad), and print that page. We live in the southern half of Missouri. For privacy reasons, I'm afraid that's all we divulge at this time. Can I come visit or stay with you? Sorry, but no. Our farm isn't currently open to the public. We're actually very private people, which is why we don't mind living several miles from our nearest neighbor. And after many years of being so secluded, what few social skills we may have once possessed have pretty much evaporated. Oh yeah, and we live in a falling down shack. Even our families rarely come stay with us. If you're interested in visiting a working farm, you may be able to find one by searching on LocalHarvest.org, which is also a great way to find locally produced food in your area. 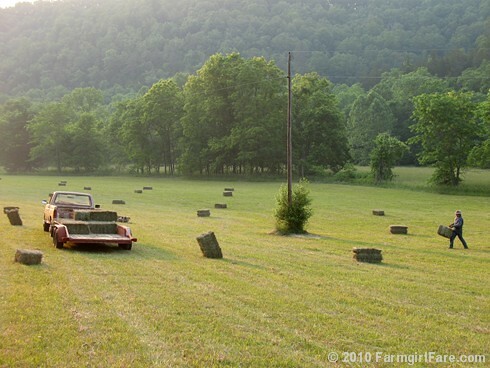 If you'd like to vacation on a farm, Farmstay U.S. and SleepintheHay.com have all kinds of farmstay listings around the country. We don't currently offer internships, apprenticeships, or working farmstays, but if you're looking to do something like that, WWOOF.org (World Wide Opportunities on Organic Farms) is an excellent organization and resource. Do you really live in a shack? Yep. I've never posted a photo of The Shack, but you can see various small sections here. When Joe bought this farm 20 years ago (I moved in 11 years ago), the plan was to tear down the house and rebuild as soon as possible, and the condition has only deteriorated since. The older half is a board covered, hand hewn log structure (similar to The Cat Cabin) that supposedly dates back to the late 1800s. We sleep in what was once the main living room, which explains the cracked linoleum on the floor and the four doorways leading out of it. We have one of those 3rd Hand support things holding up part of the ceiling. There's a slightly scary, two room area upstairs we use for storage and a gorgeous stone chimney that is slowly separating from the building. The newer half is from the 1960s and sports chipboard ceilings, fake stone plastic paneling in the living room that is so tacky it's almost cool, and plumbing pipes wrapped in black foam running along the floor and walls so they don't freeze under the house anymore. We have a battered old tin roof that always makes rain sound cozy, a charming but inefficient little wood stove in the living room (our main source of heat), and no insulation to speak of. On more than one occasion I've woken up and found a layer of ice on my bedside water glass. Both halves of The Shack are literally falling down around us. I'm hoping we'll be able to somehow salvage the historic log part. For the past eight years, we've been slowly building spacious new living quarters across the farmyard, which we plan to finally move into this year. In the meantime, we're used to life in The Shack and know that despite its many shortcomings, our living conditions are far better than most peoples' on the planet, and for that we are extremely grateful. Fall 2011 update: We've finally moved in to the new house! Your farm is 240 acres? You must be really rich. If only. Compared to many places in the U.S., land in rural Missouri is still very affordable. And as you move farther 'out,' the price per acre often goes way down. When I moved here in 1994, the plan was to find a private, liveable house on 40 acres, or a quarter mile square, which is a common sized parcel. But what I quickly learned was that because of the way most farmhouses are located—right on the road and often adjacent to one another, with each house essentially having a 40 acre backyard—unless you lucked out, finding a more secluded setting off the road required more acreage. At the time, a bigger parcel of land located 40 miles from a large (population 2,000 to 3,000) town often wasn't selling for a whole lot more than a 40 to 80 acre farm just a few miles from town. In comparison, the price that our 240 acre very remote farm might fetch today wouldn't even buy a one bedroom townhouse in the San Francisco Bay Area where I grew up. How did you decide to move to Missouri? Cheap land and low property taxes, pure and simple. I wanted to live in the country and own some land, and that was financially impossible in northern California, where I'd lived all of my life, except for an 8-month stint in England when I was twelve. The original plan was to move to New England, and I actually spent a couple of (pre-Internet) years researching and visiting Vermont and New Hampshire. Then life—as it has a way of doing—intervened, and I ended up moving sight unseen to Missouri instead. The idea—which sounded totally sane at the time—was that if we (my now former husband and I) didn't like it, we would simply keep driving the rented moving truck—and the '69 pickup with the camper full of four cats that I was driving—further east until we found some place we did like. But we arrived here in November, just days before a big ice storm (which had me mesmerized at the beautiful way everything became encased in ice), and ended up staying. No place is perfect, and while I love many things about living in Missouri, if I had arrived here in July I would definitely be blogging from another state. I'm not a warm weather person by any stretch of the imagination, and after more than 20 years, the hot and humid summers, which can often last from May through September, are still very tough for me. Thankfully autumn is beautiful. I also really miss the ocean. I love your Farmgirl Fare seasonal headers. Did you design them? I wish I had that much artistic talent! They were created by Liselotte Weller, an immensely talented Danish illustrator whom I virtually met back in 2005 during the now infamous Farmgirl Fare Name That Sheep Contest. You can see more of Liselotte's charming artwork here and read her popular blog full of lovely photos (but written in Danish) here. Do you eat any of the animals you raise on your farm? Yes. We produce all natural, grass-fed lamb and beef for ourselves and others. We also eat the occasional extra rooster. To us, there is no better meat than that which comes from an animal you know enjoyed a happy, healthy, natural life. You can read more about my meat eating philosophy in this post. Do you sell your naturally raised, grass-fed lamb? Yes we do! We have a limited number of whole butcher lambs available each year, usually in June or July. You choose the cuts you want (we can help you with his), and we take care of the rest. The meat is packaged to your specifications and frozen at the processor, and your total cost ends up being about $8 to $10 per pound, depending on the cuts you choose (for example, spareribs and shoulder roasts weigh more than ground lamb). A whole processed lamb will fit in a large cooler. July 2012 update: We are no longer taking orders for lamb or beef at this time. Just learning how to cook lamb? Check out the Lamb Recipes section of the Farmgirl Fare recipe index for delicious inspiration. I'm a new vegetable gardener. Can you recommend a good gardening book? For the past 10 years, The Vegetable Gardener's Bible is the book I've always turned to first when I'm looking for help, and each time I open it up I learn something new. This is a great introductory book for beginning gardeners, especially if you're interested in using organic methods. It's arranged alphabetically by vegetable and is packed with all kinds of helpful growing tips and inspiration. I've heard from many readers over the years who bought a copy on my recommendation and were really glad they did. The 10th anniversary edition offers even more information than the original. Do you have a favorite bread baking book? There are so many bread books out there! If you're a beginning bread baker, the step by step color photos and general information in Bread: Artisan Breads from Baguettes and Bagels to Focaccia and Brioche can help demystify the whole bread baking process, while inspiring you to start kneading. I really like the Italian Rosemary Raisin Bread, and my Carrot Herb Rolls (made with lots of shredded carrots) are adapted from Bread. The stuffed focaccia is really good. The book that first taught me about artisan bread baking—and inspired me to create and start using two different sourdough starters—is Bread Alone: Bold Fresh Loaves from Your Own Hands by Daniel Leader, who is my bread baking hero. After 18 years this book is still in print, and for good reason. My dear friend Judi Hendricks even titled her first novel Bread Alone in honor of it. Both are delicious reads. Local Breads: Sourdough and Whole-Grain Recipes from Europe's Best Artisan Bakers is Daniel Leader's latest book, and it's the culmination of dozens of trips to Europe over the past two decades in search of bakers who are still using time-honored methods and ingredients to create loaves unique to their towns and cities. Part travelogue, part bread making class, and part gastronomic history lesson, the book is full of colorful stories of local artisans and their authentic treasured recipes, many of which have been shared for the first time, and all of which have been translated by Daniel for American home bakers. I love it even more than Bread Alone. Another excellent bread book is Amy's Bread, Revised and Updated: Artisan-Style Breads, Sandwiches, Pizzas, and More from New York City's Favorite Bakery. For more yeasty inspiration, check out my Ten Tips on How To Bake Better Artisan Breads at Home. Because of your donkeys, I'm now in love with longears! Can you recommend any books on raising donkeys? Donkeys are so much fun to have around. I didn't know anything about them when Donkey Doodle Dandy came to live with us back in 2004. Now we have a herd of seven, including our two newest (and last!) additions, Gus and Gnat, and I can't imagine life without them. Donkeys are low maintenance and always entertaining. There's a nice little new book from Hobby Farms called Donkeys: Small Scale Donkey Keeping ($8.94). It has lots of helpful information, especially for beginning donkey owners. Another good book is The Donkey Companion: Selecting, Training, Breeding, Enjoying & Caring for Donkeys ($15.69). You can also find some good information on The American Donkey and Mule Society's website, LoveLongears.com. I dream of moving to the country and buying a farm. Can you give me any advice? Joe's answer to this question is always the same: "Have plenty of money and a guaranteed source of income because everything will cost more than you think!" By far the most difficult thing about farming is trying to earn a living. I don't know any farmers, including us, who don't also rely on some sort of off-farm income to help pay the bills. And the truth is, the days of just 'living off the land' are over. No matter how frugal or self sufficient you try to be, money is a necessary requirement. Even the Amish families who recently moved to our area all have cash producing, outside jobs: doing carpentry work, selling handmade baskets, running a sawmill, making furniture, etc. For example, if you buy a farm, you'll be required to pay real estate property taxes each year (in Missouri we also pay personal property tax each year on vehicles, farm equipment, animals, etc.). Some of the areas I looked at moving to in New England charged as much as 4% of the value of the farm per year in property taxes. That means for a $250,000 farm, even if you own it completely outright, you'll still have to pay $10,000 a year, every year, in property taxes. The property taxes in Missouri are very low, which is one of the main reasons I moved here. If you have a mortgage, you will of course have those monthly payments, too. If you rent a farm, you'll have to come up with monthly payments but won't be responsible for real estate property taxes. I also moved to rural Missouri because land prices are relatively low, but if I were going to relocate to another farm with the plan of earning some sort of income from it, I would choose a place that had more of an economy and was closer to a progressive urban area that had a market willing to pay a for top quality foods and goods. The higher real estate prices and ease of distribution would be worth it to me in the long run. While Joe's financial advice is definitely something you should keep in mind, I think that the most important thing you can do toward achieving your country dream—no matter what it is—is in some way, to start today. Tear up a corner of your lawn and plant a vegetable garden; visit the livestock building at a county fair and ask the 4-H kids showing their sheep and steers what the hardest part about raising animals is; go test drive a used pickup truck. Even if you never end up making the big move, there are all kinds of ways you can live a more 'country' life, no matter where you're located. I also think it's important not to let your enthusiasm carry you away so far that you become totally overwhelmed and/or frustrated, which is easy to do. If you're new to vegetable gardening, starting with a small plot with just a few tomato, basil, and pepper plants is a lot better than planting a quarter acre and losing everything to weeds and insects because you don't have the time to properly tend it. Be realistic about your abilities and experience, too. I remember reading something when I first moved out here about how it costs the same to keep a high-dollar, registered sheep from champion bloodlines as an inexpensive, mixed-breed one. That may be true, but if you've never raised livestock before, it's probably a better idea to start out with animals that aren't worth a small fortune. That way your mistakes won't be nearly as costly—because no matter how hard you try and how much you care about your animals, things will go wrong and some of them will die; that's part of the process and the experience. At the same time, don't wait until you know absolutely everything there is to know before jumping into your dream, because that day will never come. I've been living on a farm for over 19 years, and yet nearly every day I'm still faced with something new. If you're planning to relocate and buy land in the country, do as much research as you can about the area (the Internet makes this so easy) and spend some time there, preferably at different times of the year. Ask people what they don't like about living there. It can be much more helpful to learn that for three months out of the year the mosquitoes will eat you alive, or that the summers are too short and cool to grow tomatoes and peppers, than that the autumn foliage is lovely. You also need to think about the things you're willing to do without and/or put up with, and the things you aren't. For example, we have no trash/recycling pickup or mail delivery, so we have to haul our garbage and recycling into town (we do burn some trash), and getting our mail requires a 20 mile round trip drive to the post office. But these are things we don't mind dealing with, in exchange for peace and quiet and being 35 miles from the nearest stoplight. Part of the answer above is excerpted from an interview on Progressive Pioneer.